We enjoyed the Navratri festival this year drenched in spirituality and devotional prayers. The next day of VijayaDashmi, Ashwin Shukla Ekadashi is Balaji Rathotsav or Chariot Festival day in my city and some other villages here. 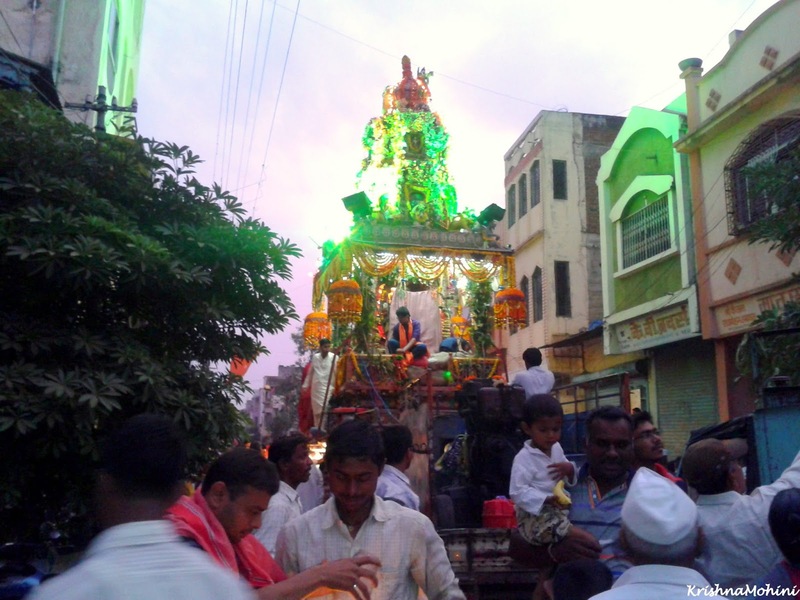 Today's post is the beautiful tale about how I met Lord Balaji in the Rathotsav. 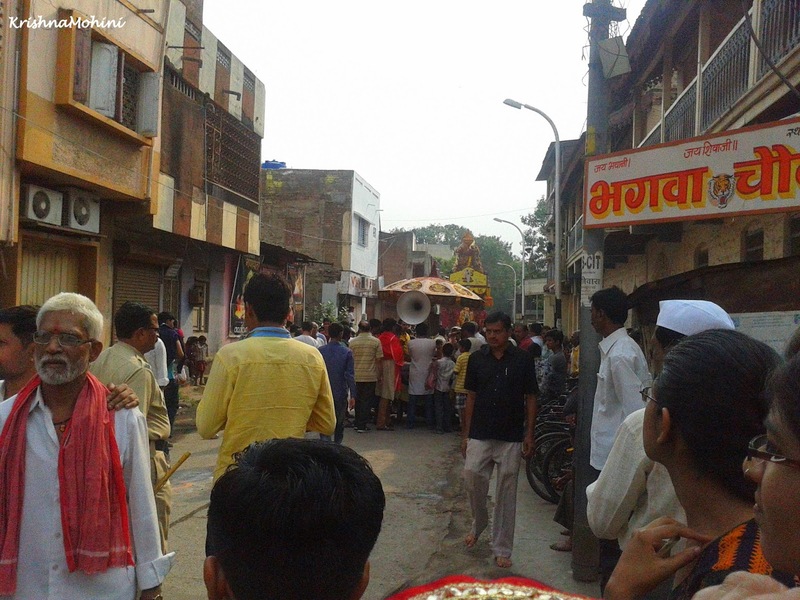 The festival begins in the morning with Pooja and Arti and devotional Bhajans are recited. 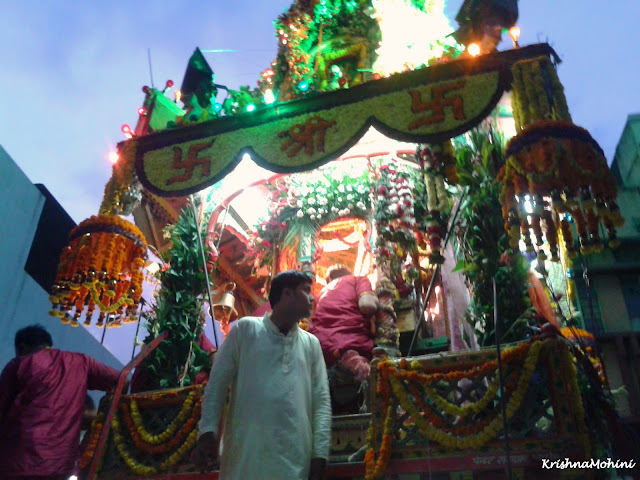 The Rath is decorated with flowers and garlands. When Bhagwan Balaji is ready to begin His journey to visit His devotees, at around 11 AM, all the devotees are requested to empty the temple for some moments. Precise Muhurt is chosen for Bhagwanji to leave the temple. Afterwards, Bhagwan Balaji, the emperor arrives and takes His chair in the chariot. The Rath reaches in the most of the parts of the city. For safety reasons the Rath doesn't cross the bridge and can't reach where I live. 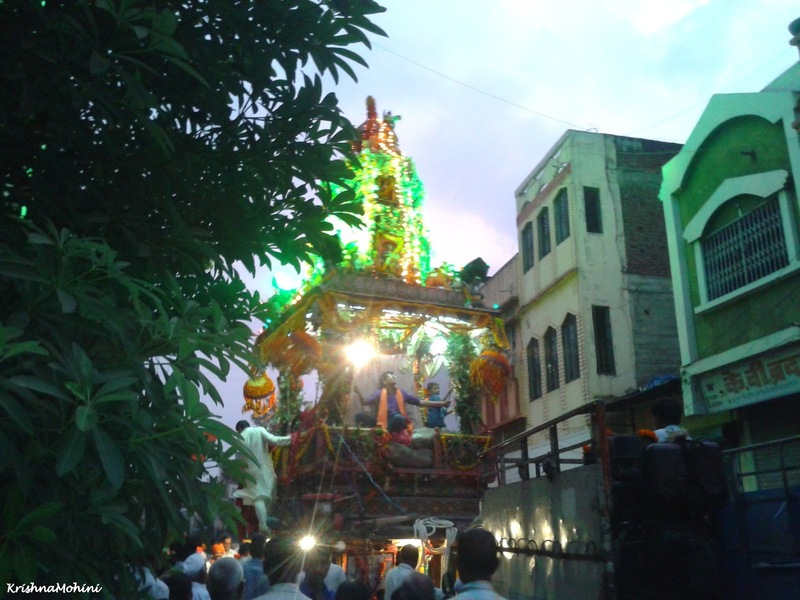 I went for the Darshana in the evening. 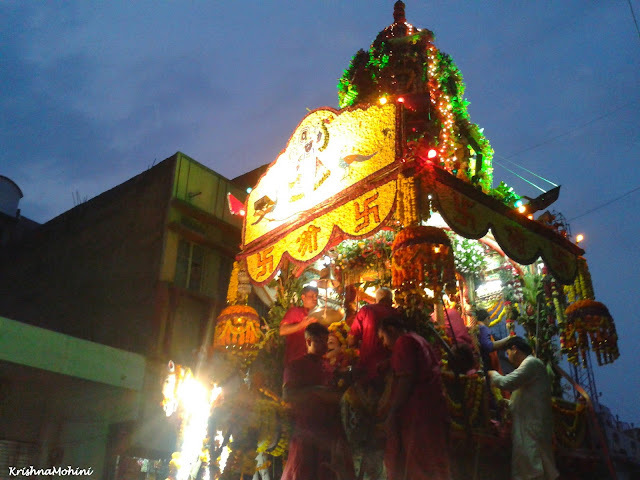 It was a beautiful Saturday evening and the roads were joyous with being full of devotees, singing "Govinda Hari Govinda Venkataramana Govinda", roads, devotees, air everything. Some devotee groups were distributing Prasad for the Balaji devotees at different places on the route where the Rath was supposed to arrive. 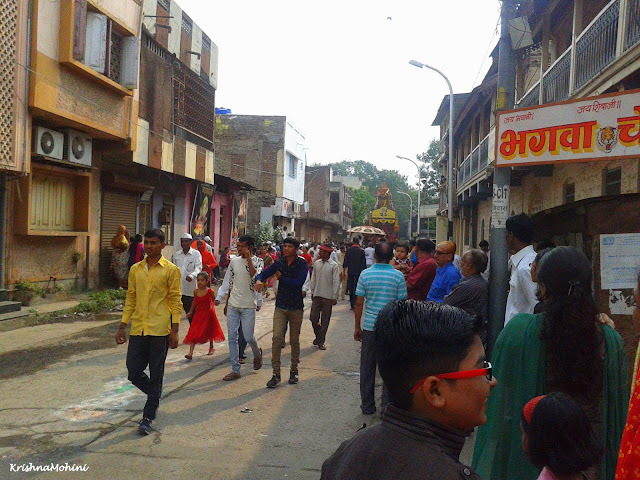 Following the devotees and guessing the direction to locate the Rath, I entered the narrow 4th lane of the city, the area closely populated by shops and the home within the shop. 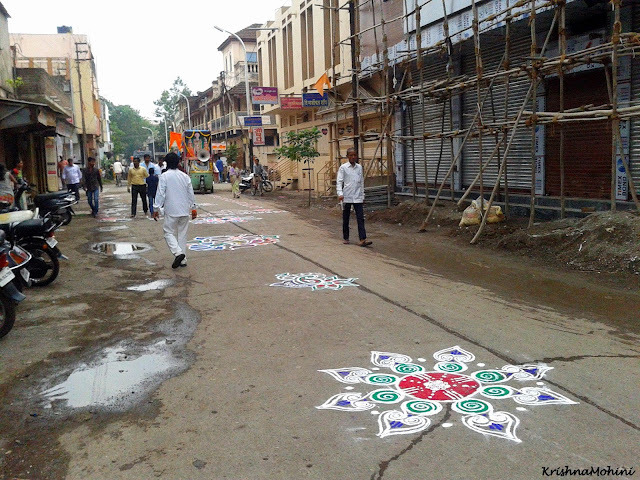 You must have heard about the famous lane design by Sir Mokshagundam Visvesvaraya in Dhule city. 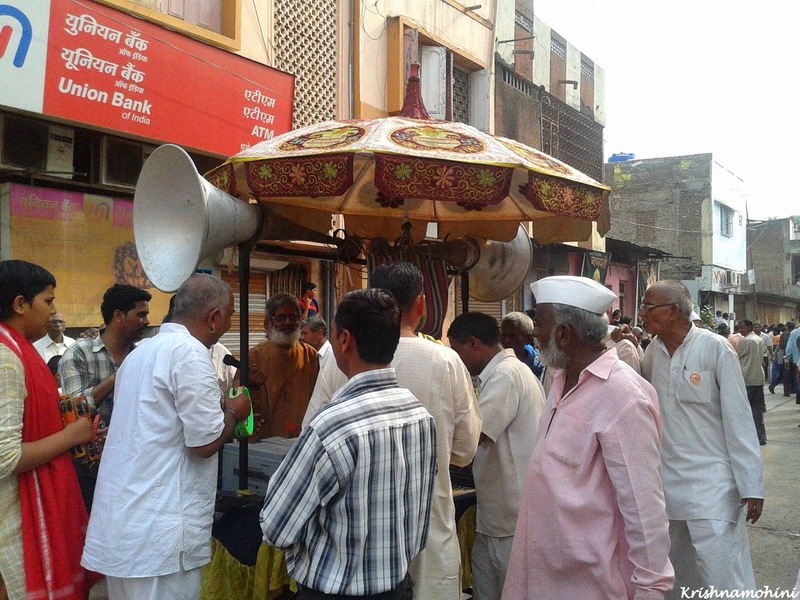 The Street vendors were selling bananas, and other food for Prasad. I followed the path. 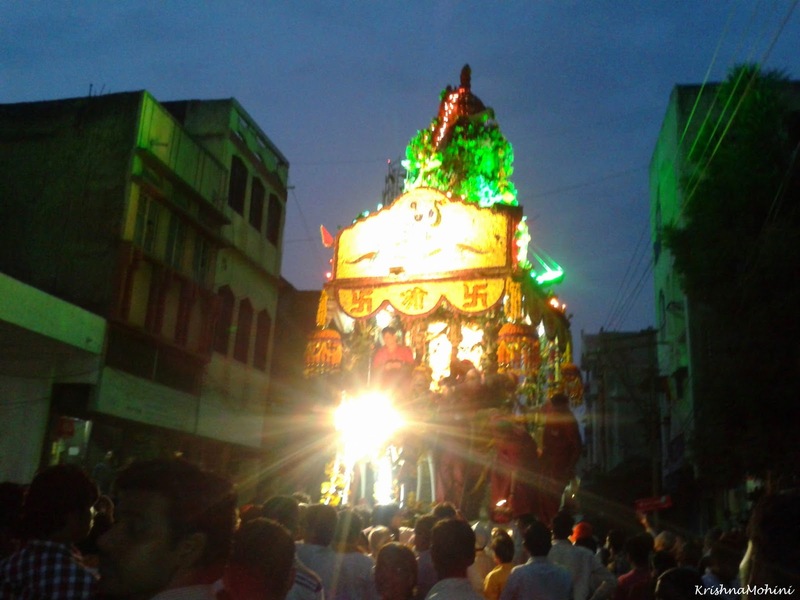 Finally, a moment came when I could see the Rath from the backside. I think, I visited this area of the city for the first time. I parked my vehicle in a safe place and thinking about you, my readers....started clicking to bring the story for you. 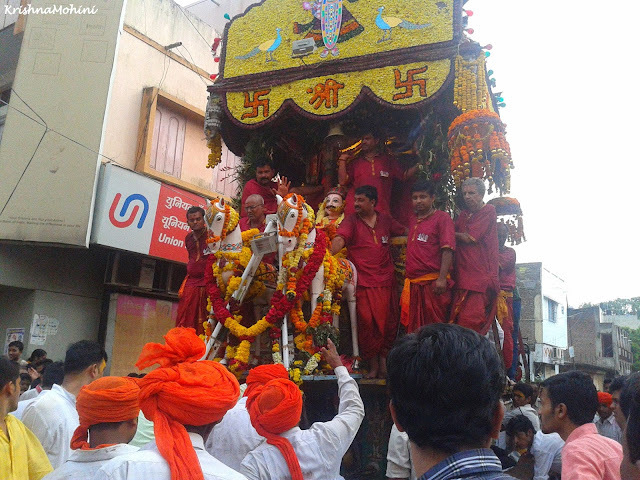 I could see the Rath and devotees. Happy devotees receiving Prasad and Arti. I tried to find the way to reach on the front side. It was devotion, devotion and devotion everywhere. Two devotees with Arti and Prasad. I just had to smile with an expression, "May I ........ capture and make this moment still?" I go a bit closer to the Rath. While clicking, I see the Sky and heavenly evening hues. 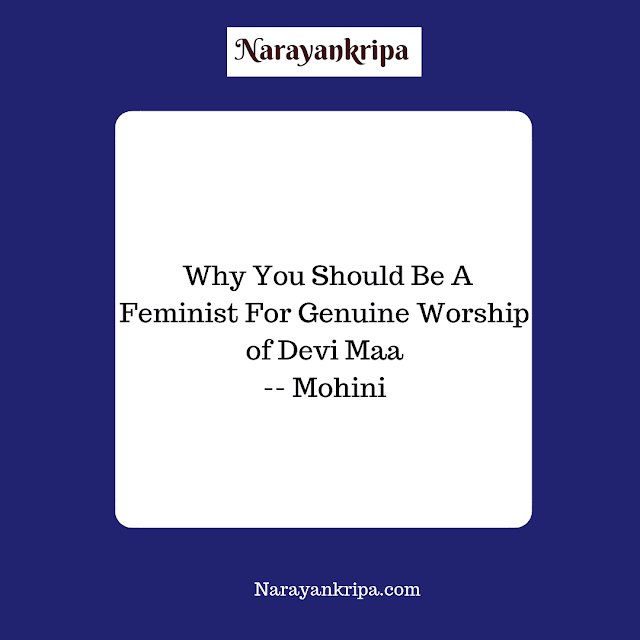 The feeling was like all the Devatas are present there for the darshan and worship of Balaji. The evening hues were so divine. 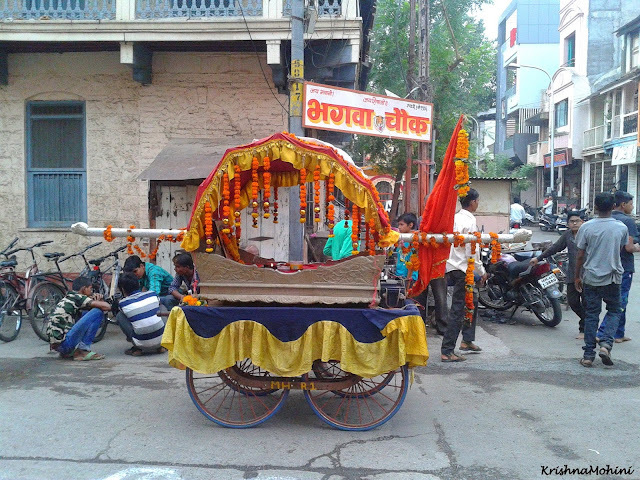 Moving or stopping the Rath in the lane, densely occupied by the devotees, the trees there, buildings and street vendors looks really risky. But, when I was there I didn't feel it at all. To ensure the safety, measures and care are taken precisely. 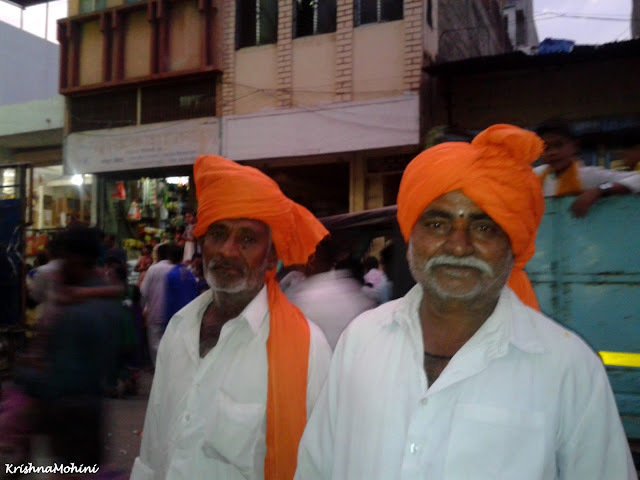 My great grandfather and grandfather used to be Purohit in this festival in their times. My Papa has also been there for some years for the same purpose. So, I have special attachment with Balaji temple and Rath festival here. I try to go a bit closer to the Rath. I kept clicking from different positions and angles to get the Darshan of Balaji. Bhagwanji was perhaps testing my devotion. And closer...Balaji was the celebrity of the day Pujaris, flowers, garlands, so many offerings to Him. We couldn't see each other. I focused on decoration and Rath, for some moments. 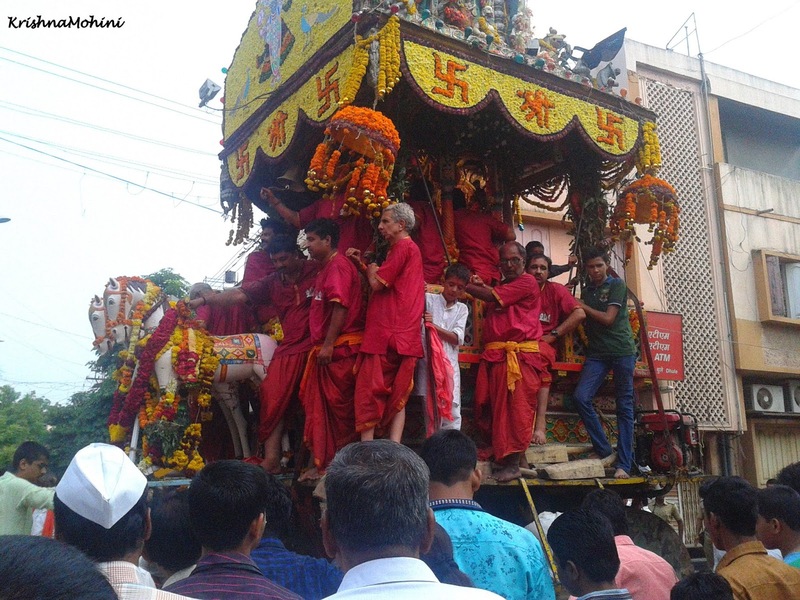 As you can see, everybody on the Rath was engaged in some task, still the speed and direction of the Rath were maintained as much as accurately as possible. 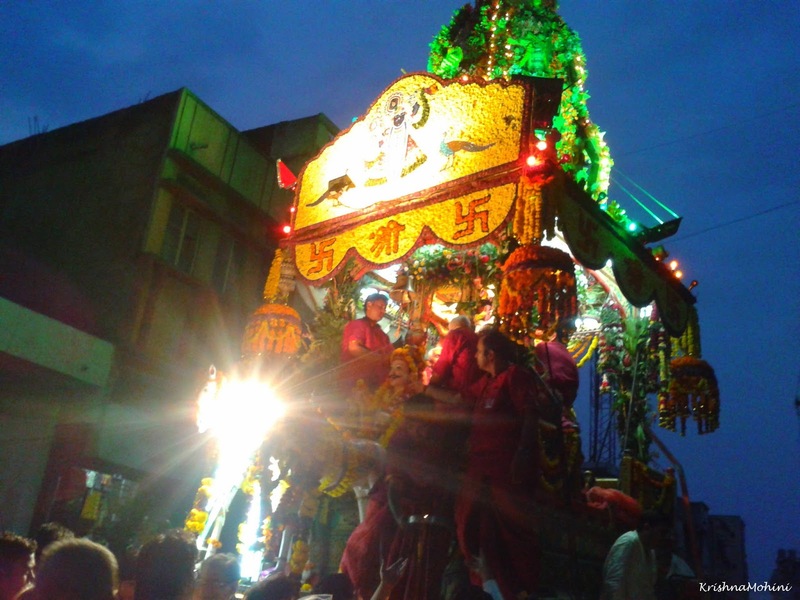 As the Rath is huge on the top, while advancing, sometimes it looks like slanting to one side. At this time the Rath was halted for Artis. I couldn't get the Darshan of Bhagwan Balaji. 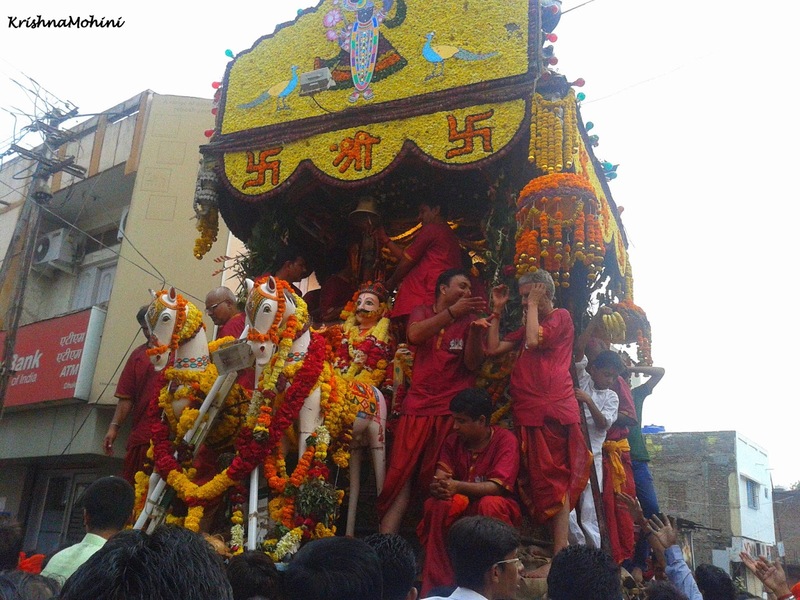 The devotees began to chant Govinda Ala, Bol Balaji and pulled the Rath unitedly with the thick rope. 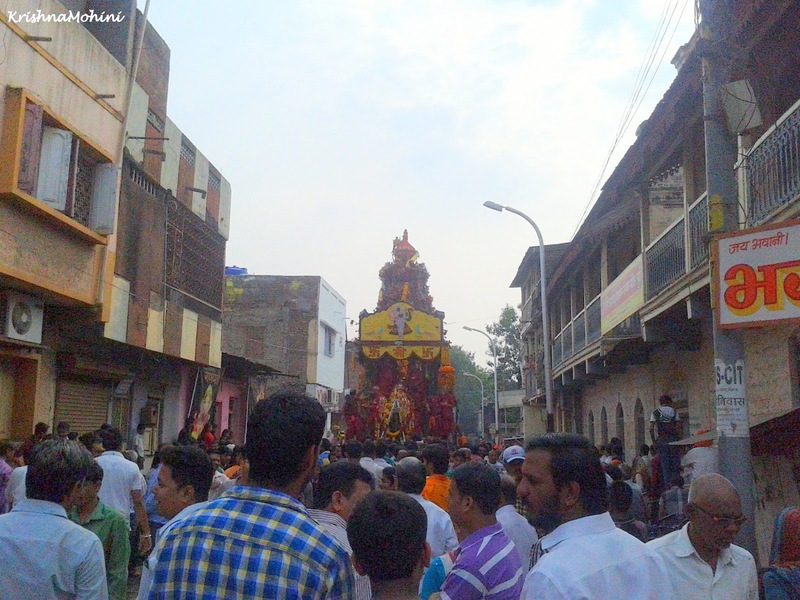 I found myself trying to stand somewhere in the crowd on the other side of the road watching the gigantic Rath moving ahead. Rath was moving, devotees were chanting, joys and hopes were loud, I was 'still'. My eyes and heart couldn't notice anything other than Rath for some moments. I was totally alone connected with Balaji only, though I couldn't see Him at all. When the Rath passed some distance, I decided to return home with the hope to try another attempt, the next morning. The Rath visits different places for the whole night. People stay awake with Arti and offering Thali waiting for Balaji to come. The next day was Sunday. 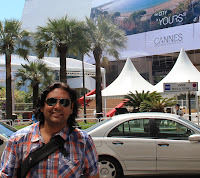 In deep sleep, my mind was planning to go meet Balaji once again, but eyes weren't ready leave the sleep. I silenced my mind saying, "It's Sunday, I'm not going to wake up and go anywhere." I drop my face in the comfy pillow and ordered my mind to enjoy the sleep again. Within half an hour I find myself on this road waiting for the Rath to come. Who is the real controller, the mind, me, or the heart desperate for Darshan? I don't know how but I was fully awake, enthusiastically happy to capture pics once again. 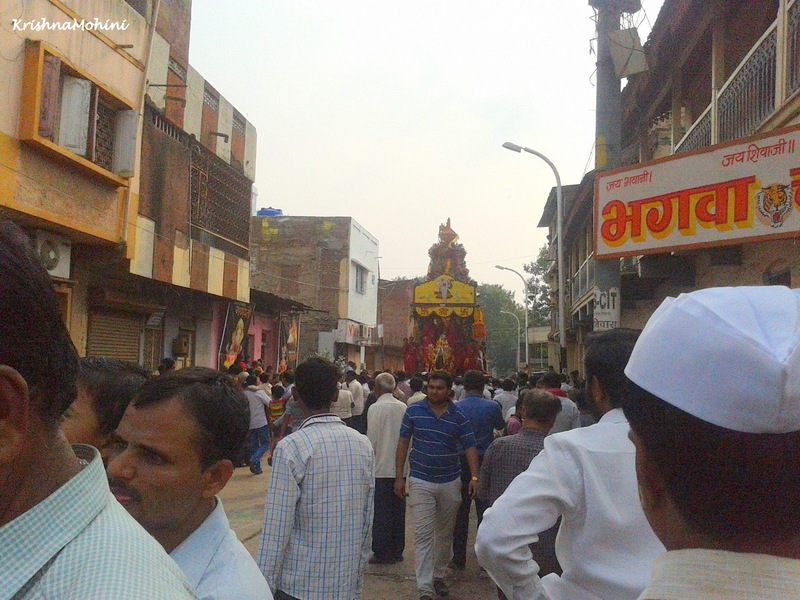 I reached near 5th lane of the city searching the probable location of the Rath in the morning. Beautiful Rangolis are drawn already to welcome Balaji. 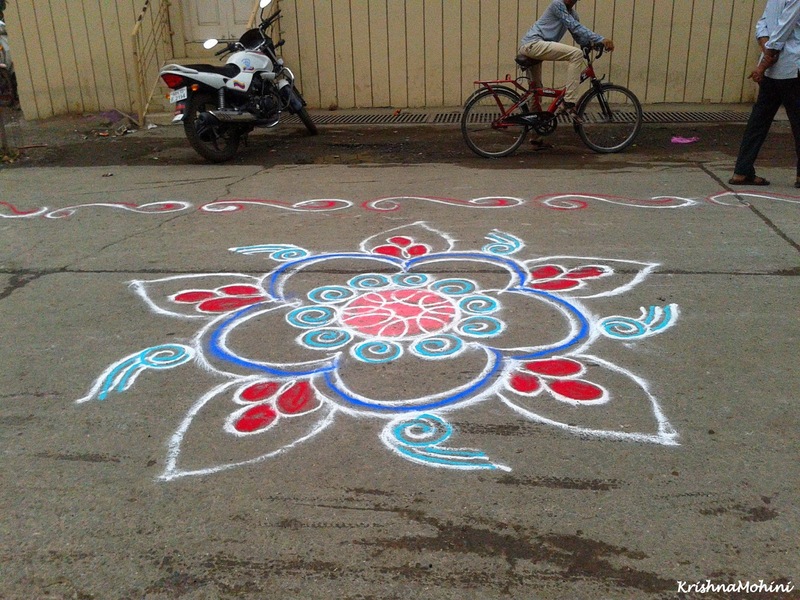 More beautiful colors for the festivity, more rangolis and increasing enthusiasm. By this particular art of drawing rangoli, large rangolis are drawn in relatively lesser time. He is coming to meet you. 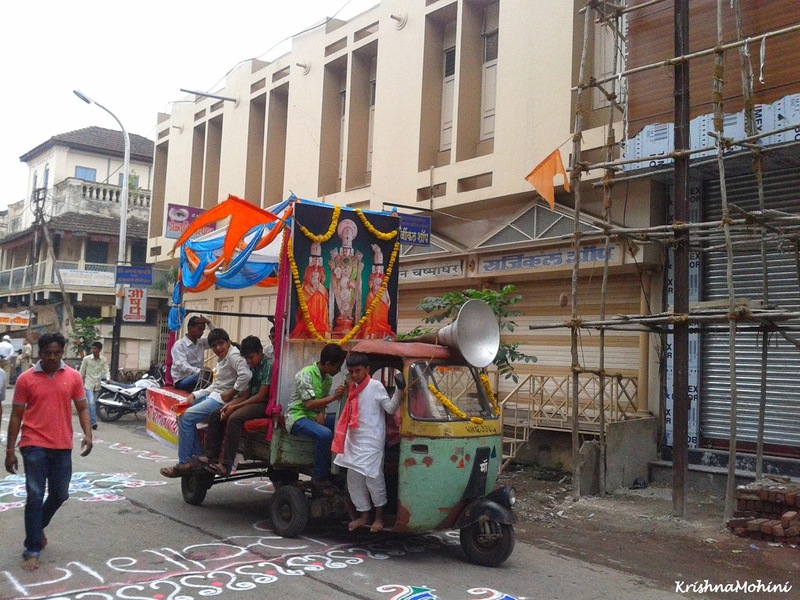 People of all the ages are equally excited about the Rath, still the fervor among children was amazing. The atmosphere was like the day was still Ekadashi; it didn't change for them. 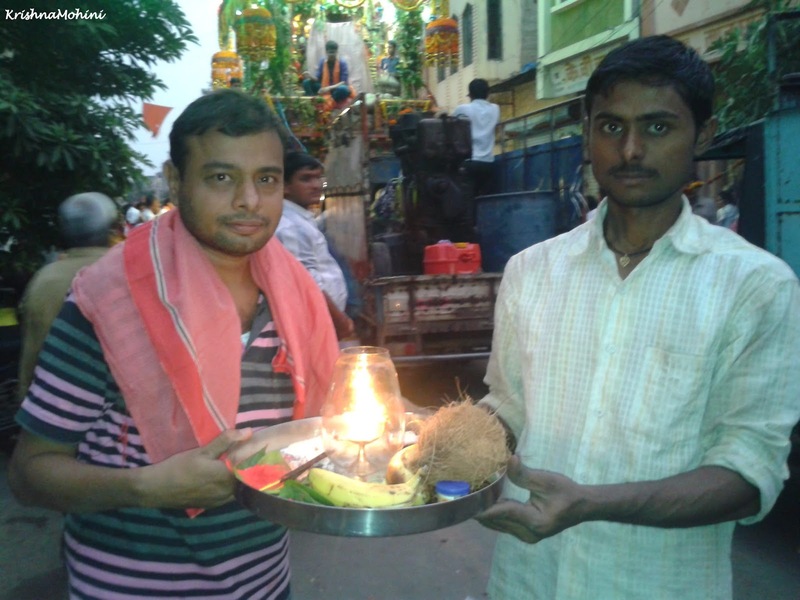 I meet the Palkhi with Balaji photos. 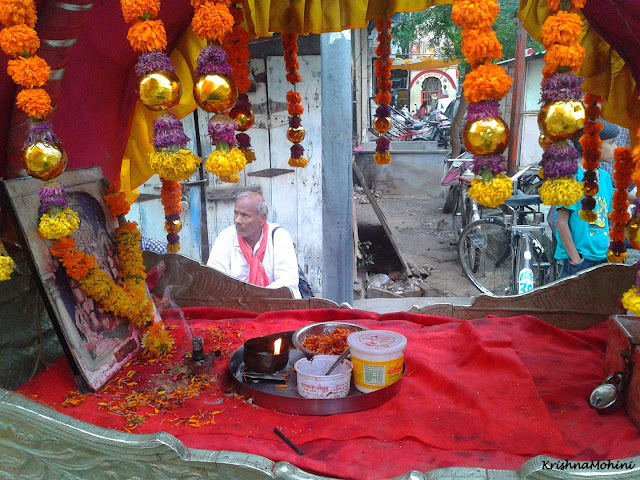 People offer Kumkum there as a symbol of their devotion and pray folding hands. The photos, Diya and Kumkum for worship. The form of worship for me was capturing these moments. I performed the Pooja in my unique way. 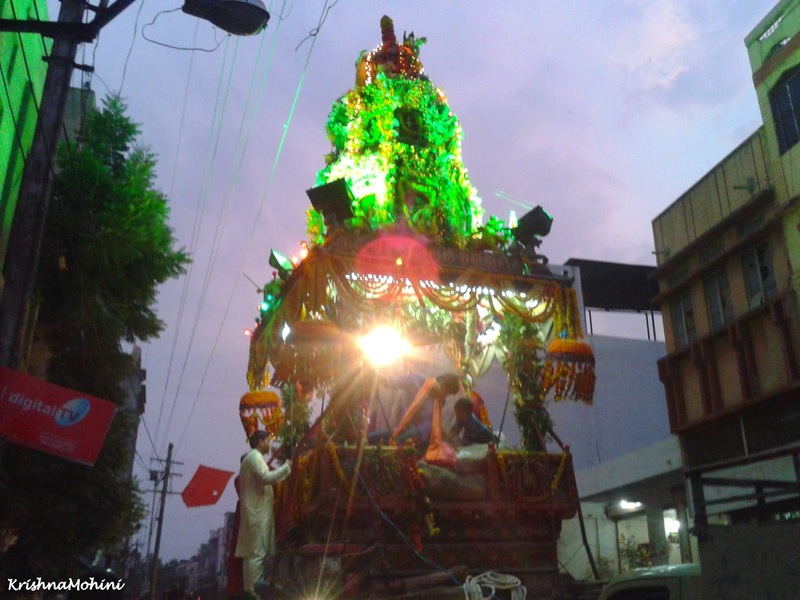 After a long wait, I could see the Rath, the chariot of Balaji. He didn't sleep the whole night. He had to meet everyone to fulfill the dreams in their eyes. He wasn't tired at all. He was the happiest person as He was meeting all the devotees who come to meet Him in the temple for the whole of the year. He cares for all of us, the rich and the poor; all are His children. People started gathering with Arti thalis. Everybody was waiting anxiously with eagerness to meet their beloved Bhagwan. I could see the Bhajan Mandali coming singing Balaji Bhajans with devotions. Loudspeakers were chanting Venkateshwar Stotram. I could hear both voices separately and breathe in the Bhakti in my heart. 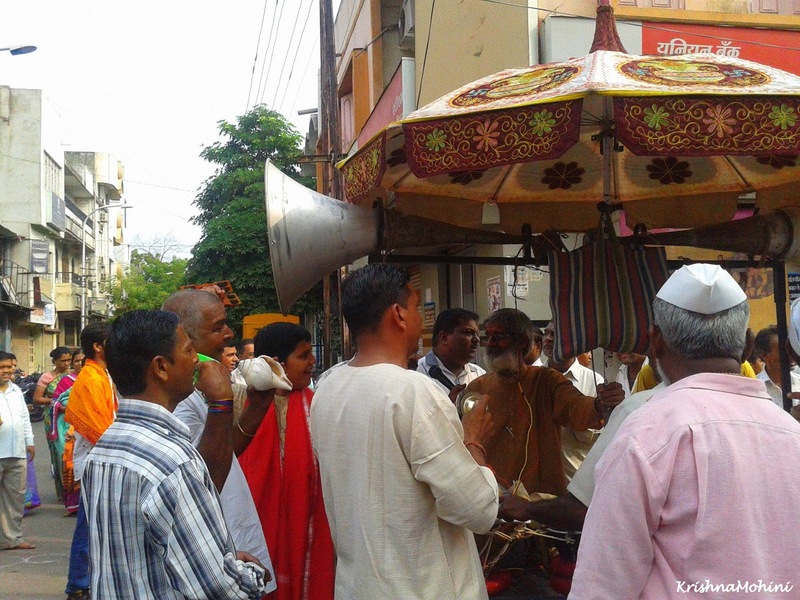 Bhajan Mandali was singing and dancing the songs of Balaji blessings and love for His devotees. These bhajans are in Hindi. I don't know them properly, but whenever I hear them, I am in Vaikunth - the abode of Bhagwan Vishnu. This must be Bhaktiyoga, 'me' - the aham doesn't exist anymore to think, believe or feel. I really don't know, how I was clicking, my heart could only hear those sacred words singing the stories of Krishna. My brain was perhaps engraving those Balaji Bhajan in my memories so that whenever I remember them again, I'll be again in the thoughts of Krishna. If I ever get overwhelmed with material duties and get confused these words remind me again, Krishna is waiting for me. And, bhajan singers made Shankha Dhvani telling, He has arrived. Be ready with your Arti and offerings, and your prayers and complaints, He is coming to meet you. 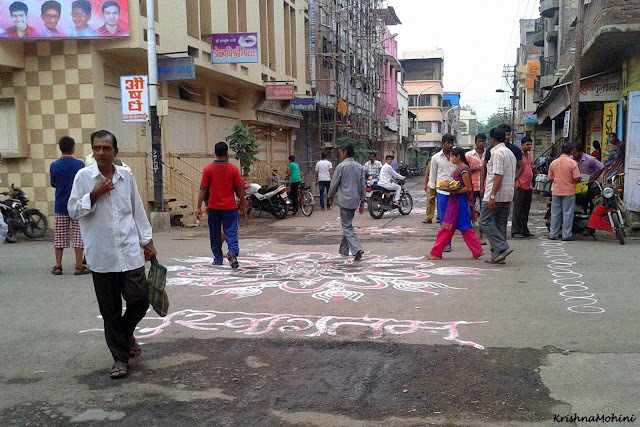 Within a few moments the road was occupied by all the devotees. 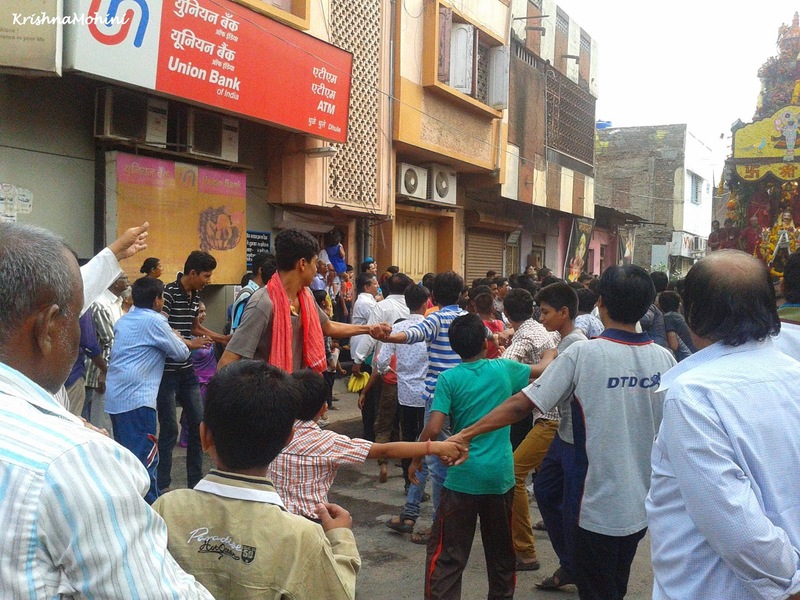 Many were there to pull the Rath. People believe it very sacred to get the chance to pull the Rath even for a moment. Wish there would be some of those moments reserved for women also, but seems that nobody have tried to ask about it yet. 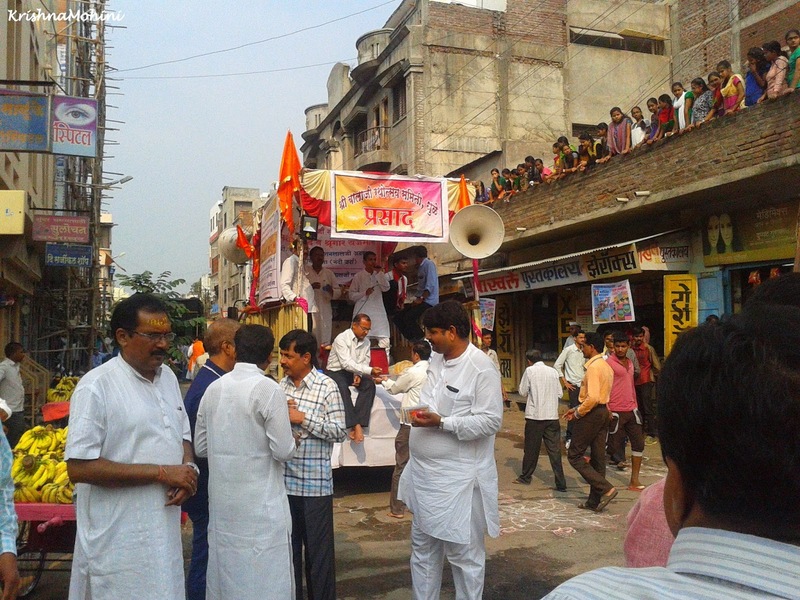 Prasad distribution was going on just ahead of the Rath. See, girls have also already found a safe place away from the crowd to have Balaji Darshan without any disturbance. Now, the Rath is so near to me. I feel a bit nervous, restless. 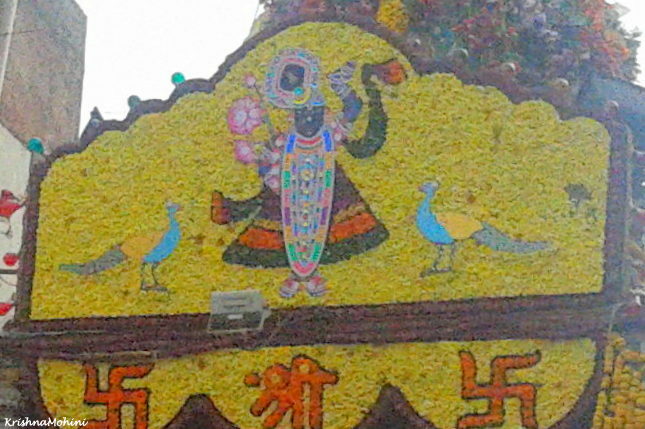 Will Bhagwan Balaji recognize me? I have been waiting for so long. I feel like a child, crying inside, though with usual calm face. I try to adjust and find the best position. How can have Darshan? Again, I begin to click restlessly like previous evening. Thankfully, it was a bit cloudy morning with a little sunshine. I always wonder, how all the Pujaris and Porohits manage to stand inside the Rath. It seems quite risky, perhaps the same way I could manage that day in the crowd. Now, the Rath is stopped for Arti. When Artis are performed, people offer their Arti thali individually. Pujaris take them, offer to Balaji and return with Prasad. Pujaris showered Tirtham, sacred water, as a symbol of Blessings of Bhagwan Balaji. 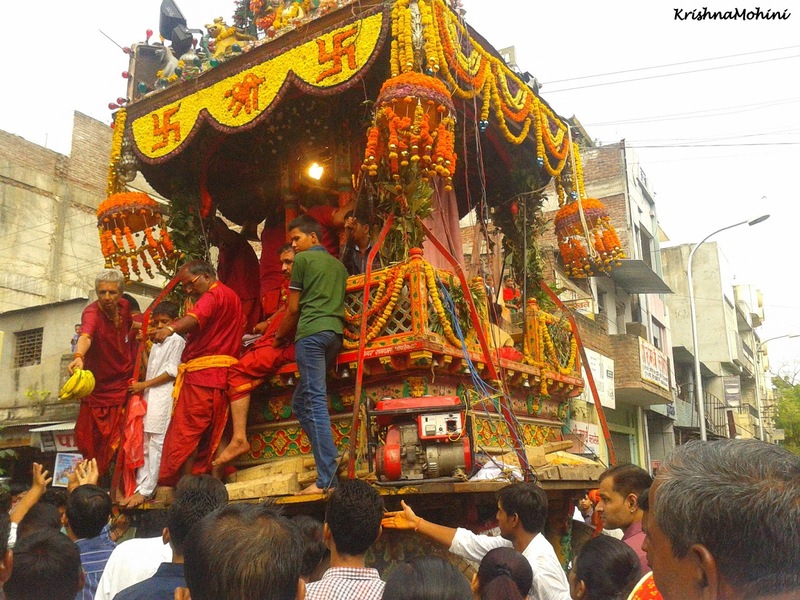 The folks covered their heads with saffron cloth manually stop the Rath with wooden manual brake. The Rath has its own brake and mechanism to control the direction and stop, but the speed of rath goes so high that it becomes difficult to stop it by the Rath mechanism only. I think, the job of these saffron headed folks is the riskiest the work in the whole journey. I requested two of them for a photo. They smiled and gave their precious expressions for me. 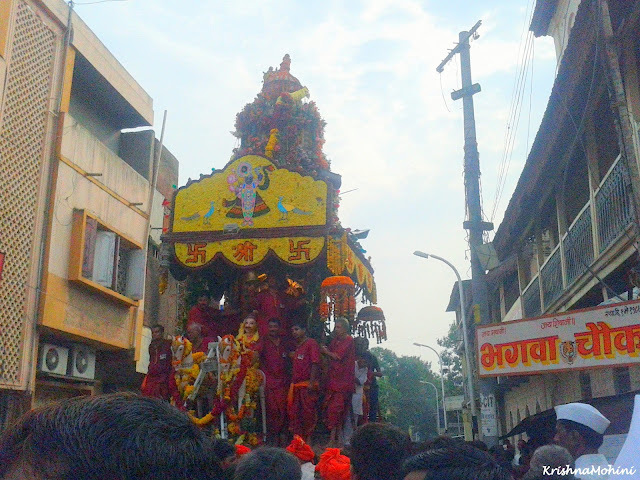 Dyaneshwarji on the left side and to the right is Nana Mahaleji. I feel them as the real celebrities because of their simplicity. They celebrate life, not by glamour, not by fame, not by controversies, but by their dedication, by their sweat for work. Their smile and the satisfaction on their face makes them celebrities of life. 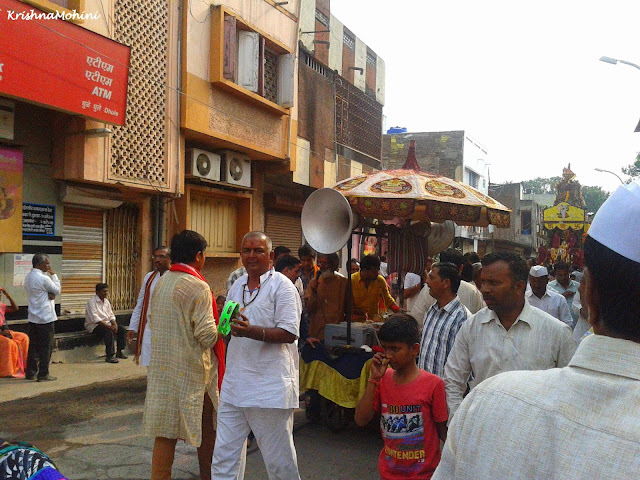 Pujaris found some carefree moments during Arti and Prasad distribution. Pujariji giving back bananas as Prasad. Rath design and the generator closer view. 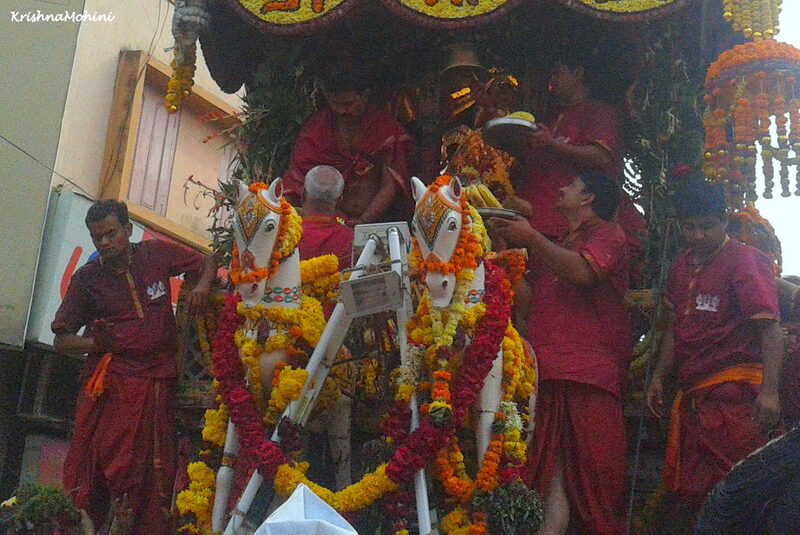 The Rath even has wooden horses on the front side. One Pujrari seems telling, "Have patience, He will hear everybody." 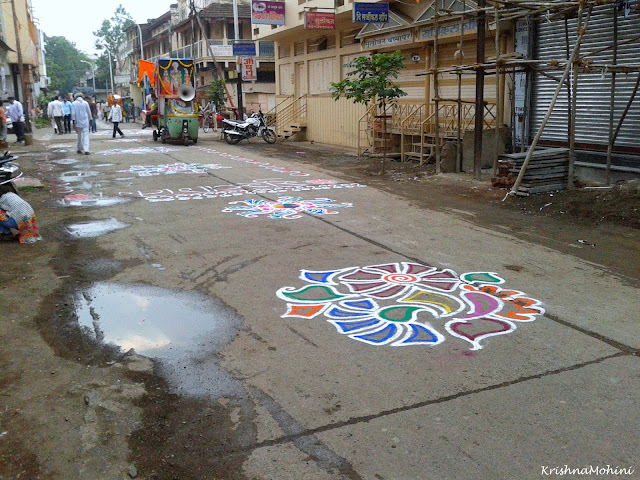 Balaji, peacocks created by flowers. 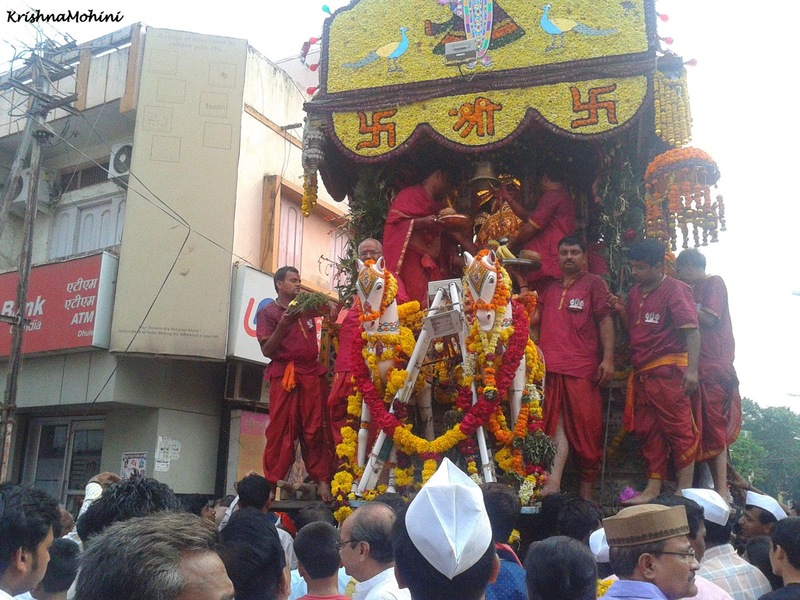 All the Rath top is covered beautifully with flowers. I didn't have anything with me to offer Him. I didn't buy anything as me and my life is the gift of Bhagwanji. He met me at a point of His journey, I stopped clicking as my eyes were closed and hands were folded. I couldn't pray anything, just taken Him with me in my heart, thanked Him for meeting me. I separated myself from the crowd, returned to my life of solitude. When Ratha returns to temple, Bhagwanji gets back to His usual work of blessing all of us through temple. Abhishekam is performed after bringing back Balaji in the temple. Purohit: The person who performs Pujas and rituals daily or for special occasions. 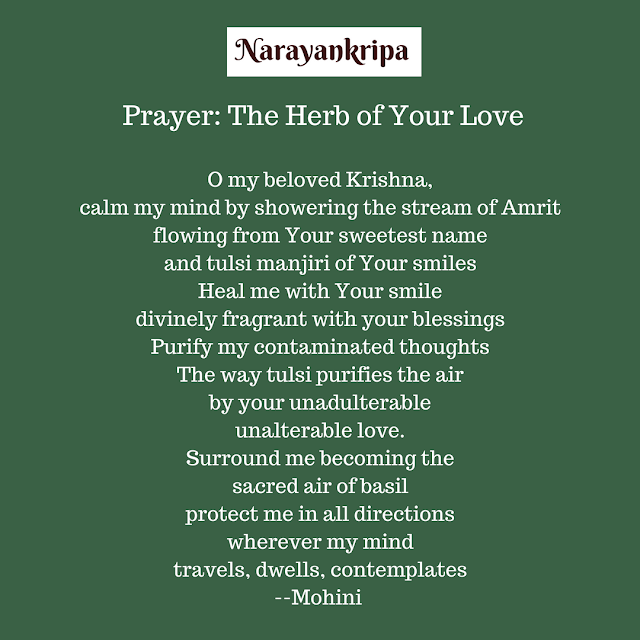 Arti: Devotional prayer sung by intense Bhakti with Nirajan. Pujari: Similar as Purohit. Pujari generally performs daily rituals for a particular temple and deity. Purohit performs Pujas for religious occasions of people also. Enter your email address to get the latest posts in your inbox.